Getting the government to grant a patent is an important way for you to protect the investment of time and money that you have put into your projects. Patents give you property rights, which prevent other individuals or companies from producing copies of the invention to sell to consumers. Patents are relatively easy to apply for and grant owners rights for a particular period of time, usually 20 years from the date of filing. Search previously issued patents to make sure that a similar invention or design hasn't already been patented. Do this before filing for a patent. See instructions on the United States Patent and Trademark Office for details regarding the various requirements for each type of filing. Inclusions for each patent application vary slightly depending on whether you are filing a utility/invention patent, a design patent or a plant patent. Fill out a Patent Application Transmittal Form. All necessary forms are available on the United States Patent and Trademark Office website. Fill out a Fee Transmittal Form. This calculates any applicable filing fees and lets you fill in credit card information. You may also pay with a check. Fill out an Application Data Sheet. This sheet includes information about you as an inventor. Write a specification of your product. This is a description of the invention or design, complete with detailed, step-by-step instructions for reproducing the invention. Refer to the United States Patent and Trademark Office instructions for detailed items that this section should include. Create drawings of the invention or design on 8.5-by-11-inch paper or 8.3-by-11.7-inch paper, if applicable or necessary to clarify your invention. Photographs are permitted only if a drawing cannot illustrate the design. If a photograph is the only way to illustrate the design or invention, it must be submitted in black and white. Fill out an oath or declaration, declaring that you invented the invention or design yourself. Send all completed documents via USPS to Mail Stop Petition, Commissioner for Patents, P.O. Box 1450, Alexandria, Virginia 22313-1450. 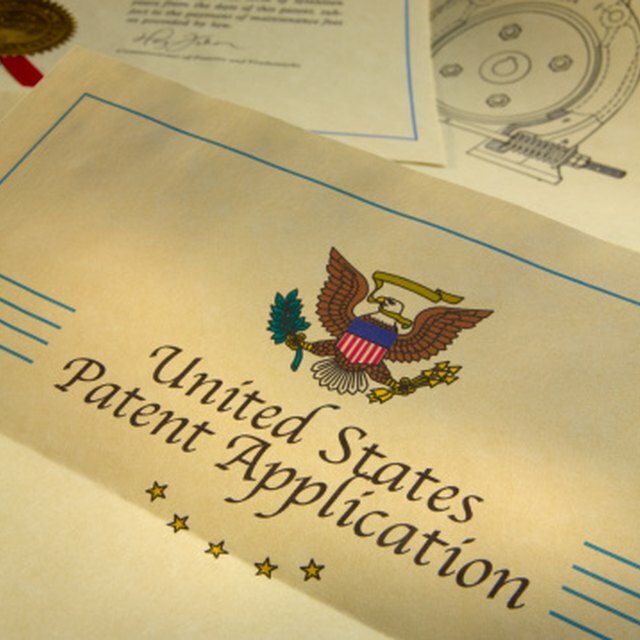 Call or email the United States Patent and Trademark Office at (800) 786-9199 or usptoinfo@uspto.gov for assistance with any patent-related questions. Chelsea Day started writing professionally in 2005 and has been featured in publications such as "Beverly Hills 90210" and "The Travel Magazine." She holds a Bachelor of Arts in political science from University of California, Los Angeles and runs the popular lifestyle blog Someday I'll Learn.